Bay City OrthoCare offers insurance-covered and self-pay rentals on Continuous Passive Motion machines (C.P.M. machines). C.P.M. machines are most often used during the first three weeks of rehabilitation following leg-related surgeries, such as a knee replacement or an ACL reconstruction. C.P.M. machines are now encouraged to be done pre-operatively, but there are options. The goals of using a C.P.M. 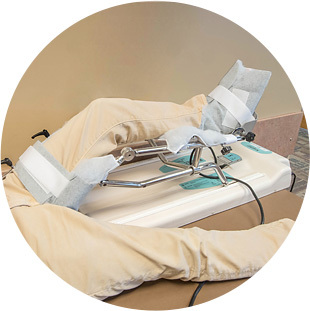 machine is to help control post-operative pain, reduce inflammation, provide passive motion in a specific plane of movement, and protect the tissue by decreasing scarring. A C.P.M. machine constantly moves the affected joint through a slow and controlled range of motion. Typically, patients begin using a C.P.M. machine immediately after surgery. Because of that, Bay City OrthoCare suggests you arrange a pre-operative appointment with us. At your pre-op appointment, you will learn the functionality and simplicity of operation of the C.P.M. machine. If the physician order requires, we can bring the machine to your hospital bedside. We offer 24-hour service to physicians who have ordered a C.P.M. machine for a patient. You will likely continue to use the C.P.M. at home following discharge. As a service to patients, Bay City OrthoCare will pick up the machine at your home or rehab facility when the doctor determines you no longer need it. Doctors typically prescribe use of C.P.M. machines for three weeks post-surgery. Many insurance carriers cover the cost of renting a C.P.M. machine as long as it is prescribed by a doctor. Call your insurance carrier to find out if you are covered. If your insurance does not cover the machine, we can arrange a self-pay payment option.